Microsoft just revealed its latest fiscal results, with a bit of a sting in the figures when it comes to sales of Surface hybrids, which have slumped considerably – in marked contrast to recent times. In fact, in the latest quarter, revenue from Surface devices dropped by a worrying 26% year-on-year. Compare that to the ‘best sales to consumers ever’ which Microsoft was boasting about at the end of last year. Of course, the problem here is that the current Surface Pro 4 and Surface Book are now starting to look long in the tooth, and more and more folks are almost certainly waiting for the next iteration of either of these hybrids before parting with the considerable wedge of cash that their price tags represent. The latter is the second compounding factor here – ever since analyst firms started picking up on the boom in 2-in-1 devices (which runs very much against the tide of the overall downturn in PC sales of recent times), more PC vendors have been rushing convertibles to the market. And as Nadella notes, that has forced pricing to become more competitive, and with Microsoft’s devices carrying a premium price tag, they’ve suffered. 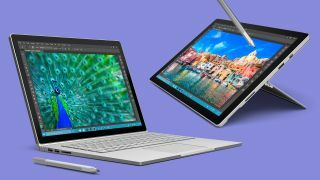 Surface fans out there have also doubtless been dismayed by the news that we won’t see a Surface Book 2 at Microsoft’s big spring hardware event next week, and it seems very unlikely that we’ll see the Surface Pro 5, either. (What we will likely see is Chromebook-style traditional notebooks running Windows 10 Cloud, pitched at the education market). And that being the case, sales of Surface devices are going to continue to dwindle, and, for example, those who are poised to make the upgrade from a Surface Pro 3, but are waiting for the fifth incarnation to emerge, might just get fed up and jump ship to a PC manufacturer other than Microsoft. Which is why Microsoft really needs to get a shift on with pushing the next Surface Pro out the door (and the Surface Book sequel as well – although that’s far less important as it’s a relatively niche product compared to the Pro model).